We had been on a roadtrip to Kerala from Mumbai to celebrate our 5th wedding anniversary! On our way we stayed at this beautiful resort at Bekal. This lush green property is spread over 27 acres with only 37 rooms surrounded by Nombili river. It has its own private beach. Without any exaggeration, this resort is so picturesque that you click a random picture & it’s hard not to look heavenly. Since Bekal is not very popular with the tourists, there were hardly any people in the resort. There was complete privacy. You feel as if you are in your own property. Checking in was smooth. Staff was very courteous. We loved the warm welcome. Best part was that they served coconut water as a welcome drink. It was so refreshing after the long drive. We reached at around 2:30pm and lunch time at the restaurant was till 3. So we immediately rushed for lunch. They have a restaurant called Nombili. 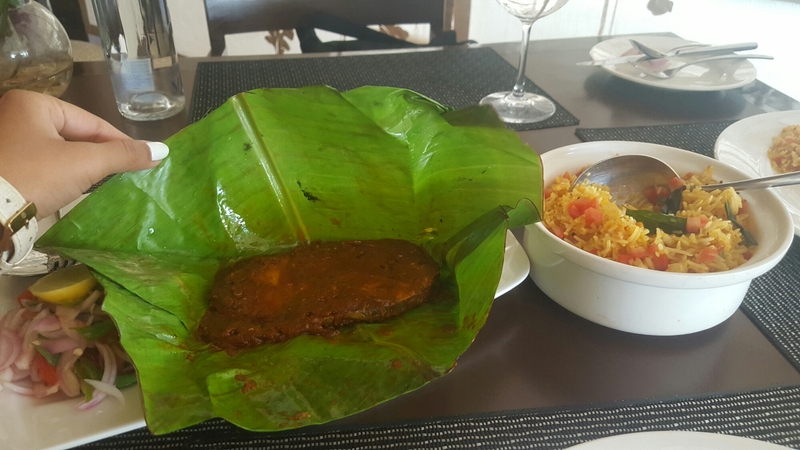 We had king fish cooked in banana leaf and tomato rice, both cooked in coconut oil. 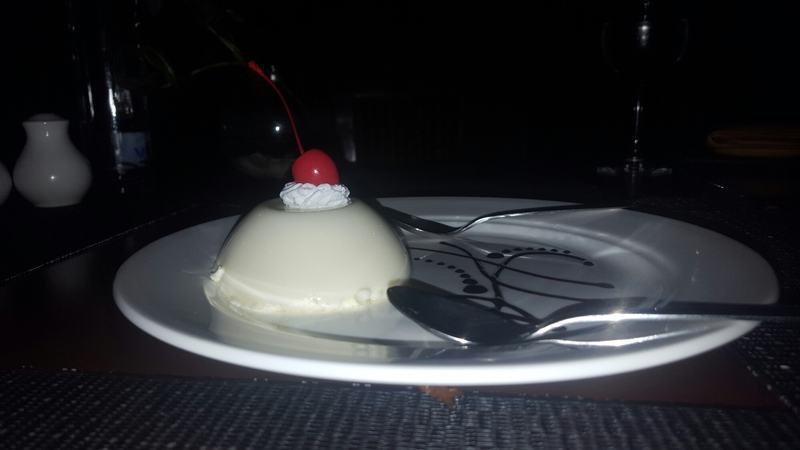 It was perfect….taste and food quality was extraordinary. They serve organic food grown in their own farm. After the lunch the staff explained us about amenities and activities in the resort. As per our request, they had given us the room with river view. We stayed in a deluxe suite. Room was huge with a lovely balcony with a river view. At one glance you can see only and all shades of green. You can sit there for hours and just admire the beautiful view. If someone asks me what is heaven, I would say, this…..mind blowing!!!! 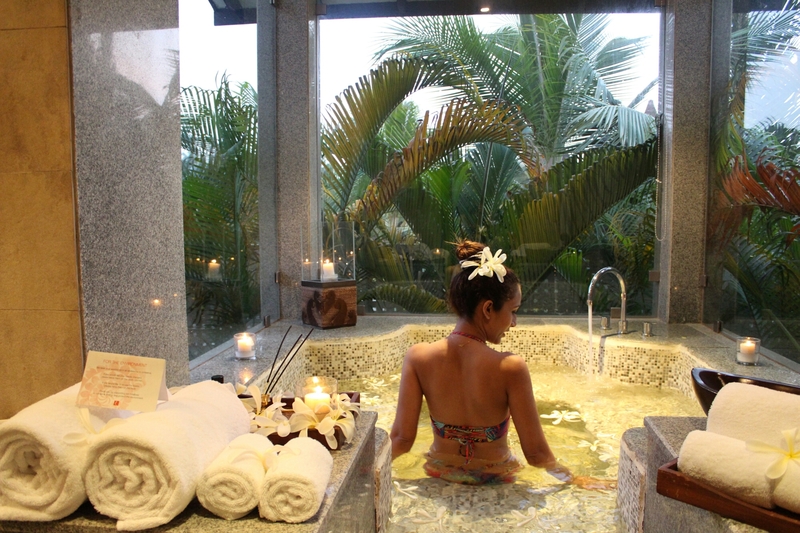 Washroom was even more bigger with a private jacuzzi surrounded by lovely palm trees. We were told that we cannot use jacuzzi ourselves. Bath butler prepares it for extra cost and it takes time(3-4hrs) to prepare it. So we asked them to prepare the jacuzzi & went to the pool. The pool was not too big, not too small. It was perfect with islands for trees in it. Not at all crowded. Perhaps we were the only ones in the pool. We felt like it was our private pool. After spending some time in the pool, went back to the room and our jacuzzi was ready. 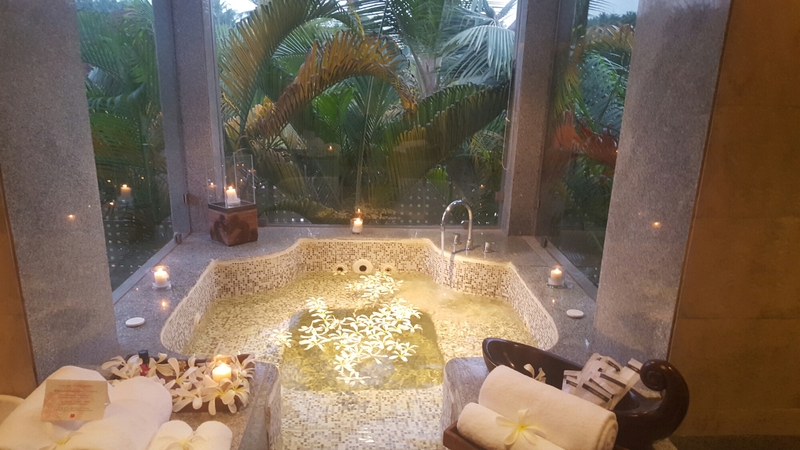 I was wondering why the bath butler was going to take so much time for jacuzzi, but when we went to the room, it looked amazing…decorated with flowers, candles and incense sticks. It was a twilight time. So the trees around still could be seen. Everything was so perfect…..Loved all the pampering!!! After the refreshing jacuzzi, we went for dinner. We ordered Prawns fry, Ulli Theeyal, Malabar paratha, Appam & Tender coconut panna cota…..Everything was delicious and high quality. This was the softest Malabar paratha I’ve ever had. 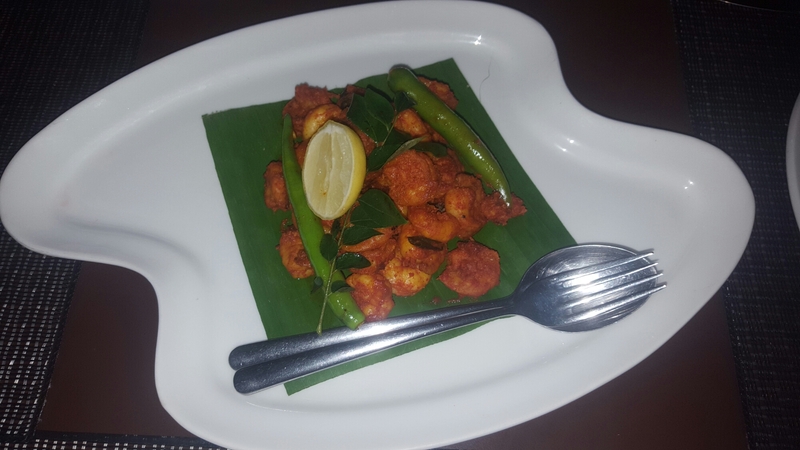 I eat quite bland food by indian standards…..so the Prawns were a bit spicy for me. When I told that it’s spicy, the chef prepared it again for me and it was yummy….I have never had such juicy prawns ever.Full marks for the exceptional service and food !! Next day morning, we spent some time in the balcony admiring the view and then went for a breakfast. There was nice buffet serving international as well as south indian cuisine and fruits. 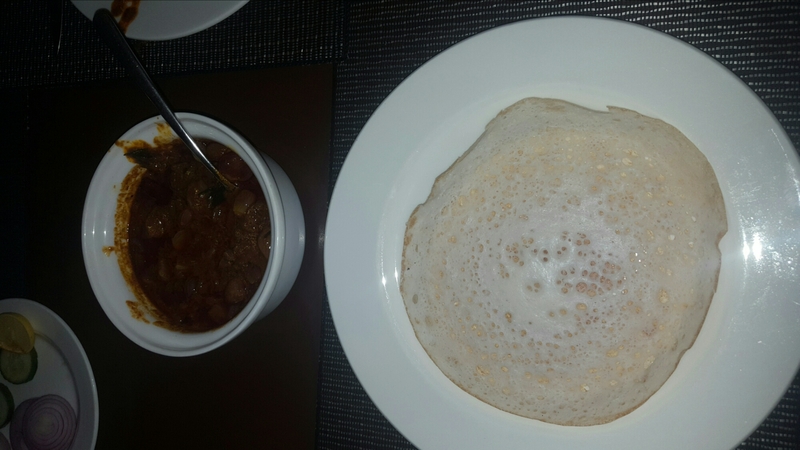 Dosa and Uttappam were very good and fruits were very fresh. After the breakfast, we went to explore the resort. There offer unlimited kayaking and boating in the river. We enjoyed kayaking. Then we went near the beach. There’s a beautiful wooden walkway over the part of backwaters connecting resort to the beach. Don’t miss fresh coconut water near the walkway. There’s a person who climbs the coconut tree in front of you and gets a coconut for you. Where else do you get such great service with so much of love? They even provide bicycles to go around the resort. They have a gym and spa. They even conduct yoga and meditation sessions. Since we were there just for a day, we dint try it. I won’t write about pros and cons here. Though there are some shortcomings, they really make up with lot of other beautiful things…. 1.There’s only one restaurant in the resort where there are timings for lunch, dinner and breakfast which gets boring if you are staying for long duration. But food is so delicious and high quality produced in their own farm, I can go there again just for the amazing food. 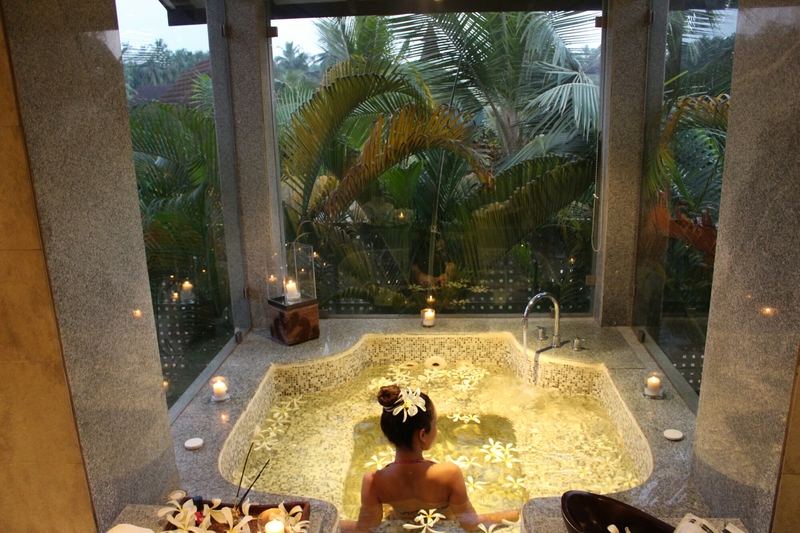 2.They prepare jacuzzi for 2k rupees but they prepare it beautifully and it’s worth the money. Other activities in the resort like kayaking and boating etc. are included and are unlimited. 3.Lighting is low at night. But day time view makes up for it. 4.Though some people would think that service is not as par with international standards, I felt it was very genuine!!! I loved the service!!! Every single person I came across was very genuine. I felt like I was living in a beautiful village with the lovely people around!!! Would I like to visit again? I usually don’t prefer repeating places. I always like to try something new. But I will definitely go to Lalit at least for lunch or dinner for their delicious food whenever I visit Bekal. Happy us……with a welcome drink!!! I find my RUNWAY wherever I go!!! Where else can you get such great service??? What I wore? I wore a short soft cotton romper with palm leaves print which was perfect for the humid weather and comfortable footwear. Bikini again with colorful palm leaves print was going well with the surrounding!!! And a black sheer dress for dinner! enjoyed reading your travel diary. Keep it up!